With all the excitement of the Stanley Cup playoffs ahead, it's easy to forget about the equally exciting off-season for the Penguins. There are going to be a lot of changes to this team this summer. The Penguins are set to be a really, really good team with the surprise insurgence of young talent over the past 2 years. That's 13.1m in open cap space. Additionally, Rob "Lead Anchor" Scuderi's retained salary of 1.1m gets expunged. Then you have to figure in 5.75m in cap space for the inevitable Fleury dealing. Then you have to factor in the expansion draft. Who knows who the Penguins will protect and expose. That's an entirely different post assuming I'm smart enough to figure out the intricacies of the rules (I'm not). I would be shocked if they don't try and lock up all of these players as they have all emerged as key components to the Penguins success. If Nick Bonino has another strong playoff - and all signs are pointing to yes - I can see them making him an offer this summer to stay with the team. Jimbo Rutherford needs to sign all RFA's and lock in Schultz and Sheary to long-term deals, yes? How much is fair? Well enough foreplay, here is my theory. It DOES sound expensive! So obviously that's a very simple calculation that takes into account Schultz's breakout season as a premier defenseman. Schultz's Career Points per Game is .46. his best (this season is) .65. Let's split the difference to allow a safety net. That would be .56 average points per game. 46 points per season X $127,412 Avg NHL cost per point = $5,818,616 cap hit. I feel like I'm getting warmer. Still seems high to me. I calculated this formula against the entire NHL's payscale. I took all current cap hits vs the above calculation. There is such a thing as a "hometown discount" or "term discount" and it stands around 15%. I understand that this formula has its flaws. It does not take into consideration a player over 35, it does not consider a player who's job on the team does not include points (ex: Bouwmeester). For the player's I'm trying to determine I think it makes sense. Sheary ended up 23rd overall in points per game with .87. So ... Yeah I feel the same. I would hope GMJR would sign Sheary a bridge deal with the advantage of Sheary being an RFA this summer. This would hopefully give Sheary time to grow and further evaluate his game. If he keeps producing then it's hard to argue against that much money for a young talented forward who is putting up 30g a game. Again, this is just a theory and not factual information. There are alot of factors into a contract negotiation that I'm not considering or would even think to consider. 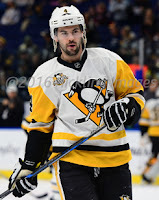 On Sheary I'd offer is that if we want to come up with accurate comparable players they should have similar position, size, age, and production. So players like Marchand, Skinner and Gaudreau are applicable. I hope we can sign him to a bridge deal as well. However, I do think the Sidney Crosby factor has to be taken into account. He'd still be productive but his production would dip. Regarding Schultz though, your projection is pretty spot on. A 26 going on 27 year old right handed Dman who just put up 50+ points is the unicorn that every team is searching for. 5.25 mil per season for 4 or 5 years would be a good deal. I agree with you on Shears. Bridge deals are not uncommon although I think players aren't too fond of them. If he keeps it up, he might price himself right out of town sadly. Someone dumb like the Rangers or Capitals seem to really love overpaying for Pens' scraps. Thanks for your feedback!